WEST ALLIS, Wis. - Following a week of disrupted campaigning due to Hurricane Sandy, Mitt Romney on Friday offered the closing argument that he had hoped to be pushing all week -- as a bipartisan change agent who will halt Washington gridlock to create jobs and lower the national deficit. The Republican nominee argued vigorously that President Obama has "fallen so very short" in each of these areas, asking the electorate to judge each man by his achievements. "He promised to be a 'post-partisan president' but he became the most partisan -- blaming, attacking, dividing," Romney said to a crowd of 4,000 at a pavilion on the state fair grounds in this Milwaukee suburb. "He said he was going to focus on creating jobs. Instead, he focused on Obamacare, which killed jobs. He said he was going to cut the federal deficit in half and then he doubled it." Romney pointed to the jobs numbers announced Friday - which showed the unemployment rate ticking up to 7.9 percent even as 171,000 nonfarm jobs were created and more people again joined the ranks of those looking for work - as yet another example of Obama's failure. "He said he was going to lower the unemployment rate down to 5.2 percent right now," Romney said. "Today we learned that it's actually 7.9 percent, and that's 9 million jobs short of what he promised. Unemployment is higher today than when Barack Obama took office." As he campaigned in Montrose, Colo., Romney's running mate, Rep. Paul Ryan, echoed the sentiment that the economy is not recovering fast enough. "What we are seeing today is that 23 million Americans are struggling to find work today. What we see today is that 15 percent of our fellow countrymen and women are leaving in poverty. This is the highest poverty rate in a generation," Ryan said. The Obama campaign responded by calling Romney's claims laughable and arguing that he would bring back the "failed policies of the past." "If we've learned one thing about Mitt Romney in the closing days of this campaign, it's that he can't be trusted to tell the truth or keep his word," wrote Obama for American spokeswoman Lis Smith in an email to reporters. "He's been spreading falsehoods about Jeep and GM and misrepresenting his positions on everything from health care to foreign policy. That's why Americans should be very wary of his claims of bipartisanship." Romney touted his own experiences in the business world ("I built a business, and turned around another"), overseeing the Salt Lake City Olympics ("I helped put an Olympics back on track"), and running the state of Massachusetts ("I learned as governor of Massachusetts that the best achievements are shared achievements") as examples of his own achievements that show he has the leadership skills needed to run the country. "President Obama promised change, but he could not deliver it," he said. "I promise change, and I have a record of achieving it." Romney kicked off the final fourdays of the campaign here in Wisconsin, a state he hasn't visited since the middle of August and that was once thought to be a safe bet for President Obama. But after adding native son Ryan to his ticket and his strong debate performances, polls have shown the race tightening in the Badger State. The most recent NBC News/Wall Street Journal/Marist poll showed Obama up 49 percent to 46 percent, an amount within the margin of error. As he did in the debates, Romney continued to sell himself as a moderate dealmaker who will work to find democrats that he can work with in Congress to pass legislation - something he said the president would be unable to do. 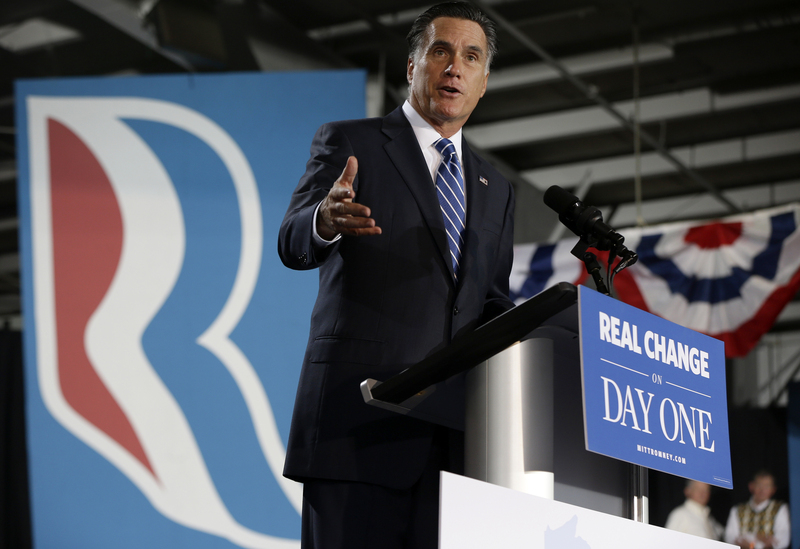 "You know that if the president is re-elected he will still be unable to work with the people in Congress," Romney said. "I mean he has ignored them. He has attacked them. He has blamed them." A Romney administration, he said, would be different. "I won't just represent one party, I'll represent one nation." He was drowned out by applause - a sign that his new message of cooperation and unity has hit a chord with voters in the Midwest. The message has been carried across the ticket as Ryan touted his and Romney's records of working across the aisle. "We can come together," he said. "Republicans and Democrats can come together to solve this country's problems. And we have a proven record for actually doing that. Mitt Romney did that that as governor, and I have been doing that in the House. We know that Americans love America and it doesn't matter what party you come from. We can fix this country's problems." Rebecca Kaplan contributed to this report.